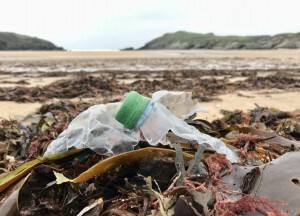 Single-use plastic plagues our environment forever; it never goes away, just breaks down into smaller and smaller pieces. 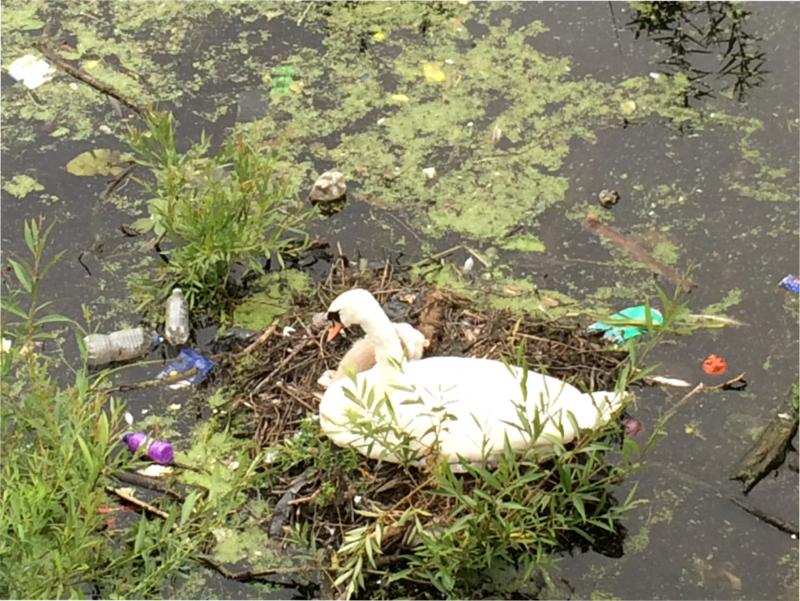 It litters our environment and pollutes rivers, oceans and lakes. And, evidence suggests that it’s already in our food chain! OK, we all know about the problem, but the question is: what are we all doing about it, as individuals, families, schools and businesses? One thing is for sure: forward-thinking businesses want to be seen as part of the solution, not the problem, so there are some great companies doing great things. For those companies that want to do their bit but don’t know where to start, we’re more than happy to help. 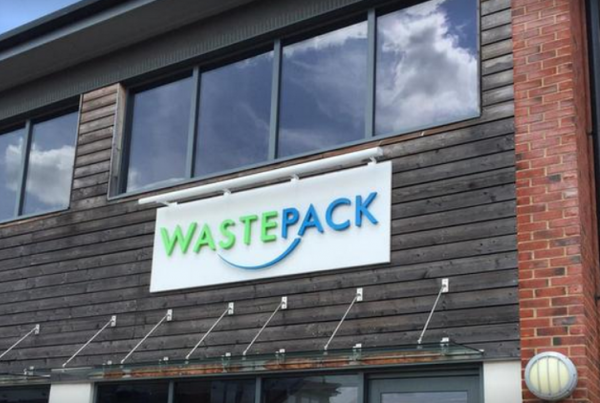 In fact, our Plastic Clever Business initiative might just be the ideal place to start. It also requires a company to actively encourage its employees to be Plastic Clever, too. But how? 1. Download this poster and check you meet the criteria. 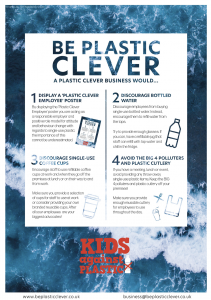 The criteria for becoming a Plastic Clever Business are simple and straightforward. Print this resource as an A3 poster for display. 2. Print out this poster and display it in a staff shared area. Feel free to print as many of these posters as you need – maybe at A3 size for maximum impact. The more employees that see them, the bigger the impact you’ll have. 3. Take a photo of your Plastic Clever Business and send it using the form on the right-hand side of the page. We’ll then send you a certificate of achievement and add you to the map of Plastic Clever Businesses. 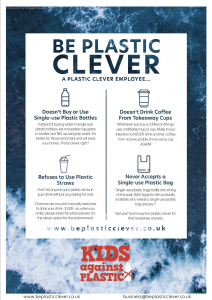 We’ll even write a short blog post to celebrate your commitment to a plastic clever world. Fill in the form and hit ‘Send’ and we’ll add you to the list of businesses that are taking their responsibilities towards plastic seriously. We’ll also email you your Plastic Clever Business certificate. Add yourself to the Plastic Clever Business map, or ask us to and we’ll be happy to help. NB. We’ll add you automatically once you’ve registered. Use this link to see a list of Plastic Clever Businesses.